Needless to say, much of the inspiration for this website comes from the experiences I and all of the student contributors have had with our teacher, Dr. Dement. Over the past 40 years and 41 sessions of Sleep and Dreams, Dr. Dement has taken his classes on a journey through understanding a portion of their lives that is all too often overlooked. In honor of that anniversary, we have created this website in an attempt to bring that extraordinary journey to even more people, yourself thoroughly included. 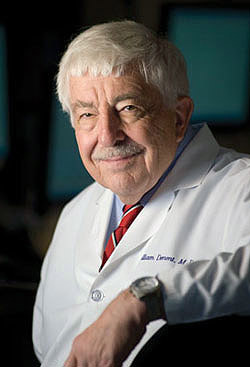 Dr. Dement is the world's leading authority on sleep, sleep disorders, and the dangers of sleep deprivation. He is considered also to be the father of sleep medicine. From pioneering the field in the 1950s with the first all-night polysomnographic recordings, to the rush of discoveries that took place in the following decades, the field owes incalculable gratitude to his work and energy. Likewise, we are similarly indebted to our professor for lending his keen eye, suggestions, and support to this website since its inception. As students in Sleep and Dreams, we all know that Dr. D is from Walla Walla, Washington (his pride for his hometown makes its way into most lectures). He stayed in Washington until he graduated with a bachelor's degree from the University of Washington, at which point he made his way to Chicago for his graduate studies. Fortuitously, the University of Chicago happened to be the only place in the world where someone was formally studying human sleep. That someone was Dr. Nathaniel Kleitman, a man who quickly became Dr. Dement's mentor while ushering him into the almost completely untapped field. You can hear Dr. Dement talk a bit about this time in his life and the exciting times that followed in the video below, a wonderful little tribute to the professor from Stanford University. It's a fantastic piece and it will really give you a lot of insight (as much as a 12 minute video can do) into Dr. D's story and how the Sleep and Dreams class came about. Have you been affected by Dr. Dement in some way in your life? During this time at Chicago, Dr. Dement was the first to intensively study the connection between dreaming and the rapid eye movements being observed by Kleitman and Dement's fellow student Eugene Aserinsky. This work led him to develop the scanning hypothesis, which holds that ones eye movements during sleep correspond with the eye movements being carried out in the dream world. In 1953, Dr. Dement performed the first all-night polysomnography test, measuring eye movements and brain activity, an event which he has stated marks the time at which the study of sleep became a true scientific field. These recordings, after many trials, led him to discover and classify the five stages of sleep and their patterns throughout the night..
After spending some time in New York, Dr. Dement made his way again out west, this time settling at Stanford University, where the new medical school had moved from San Francisco and where he's remained ever since. In 1975 he launched the American Sleep Disorders Association, now known as the American Academy of Sleep Medicine, and served as president for its first twelve years. In that same year, the start of what he would later call "the decade of discovery," Dement and Mary Carskadon invented the Multiple Sleep Latency Test, a test of how quickly people fall asleep throughout the day. Today, 35 years later, Dr. Dement considers the development of the MSLT and its ability to monitor daytime alertness the most important thing he's done and the most important step forward that has been made in terms of understanding how sleep effects humans throughout the whole 24-hour day. To list all of the man's feats and contributions to sleep science and medicine would be an extraordinary feat of the pen--or keyboard in this case--so we'll instead provide you with a video of Dr. Dement in action at Google, as well as some thoughts straight from his own students. If you'd like to see Dr. Dement in action, the following video is a lecture he delivered as part of Google's "Personal Growth" series of TechTalks. It's a little over 50 minutes long, during which Dr. D takes you through many of the vital points about sleep. He also adresses Google employees in a Q&A at the end. "DROWSINESS IS RED ALERT!!! Repetition is Good!" These are just two phrases our professor Dr. Dement enjoys shouting out into his Sleep and Dreams class. Even though Professor Dement enjoys making his class fun and relatively stress-free compared to other courses (ahem, like Math 51), his message of the importance of sleep is always emphasized in the process. The knowledge of sleep that he has taught us in five weeks (at the time of writing this) has already changed many of our lives (and has possibly even saved some too, directly or indirectly). The following quotes are testimonials from students in the Winter 2010 class of how Professor Dement has influenced our lives by giving us invaluable knowledge about sleep, its positive effects when things go right and negative effects when they go wrong. Are you a Sleep and Dreams student, past or present? Have your own memories to share? Share with us how the class has touched you here. "How has Sleep and Dreams affected your lifestyle?" The class has made me more aware of the discrepancy between how much sleep I need and how much I'm actually getting - and how detrimental that can be to my health and happiness. "Sleep & Dreams" has dramatically influenced the importance that I place upon sleep in my daily life. I am much more aware of the amount of sleep that I need and value the right amount of sleep incredibly more. I make sure that I make a conscious amount of effort to achieve the amount of sleep I need and pay attention to my sleep debt and trying to pay it back. I will also always remember "Drowsiness is Red Alert" if I ever find myself in a situation where I feel drowsy while driving a car or operating any machinery, as well as pass that motto onto others who might find themselves in a risky situation. It has truly been an incredibly valuable class, and one that I will never forget. Sleep and Dreams has opened up my eyes to the importance of sleep. I'm trying to get more of it now, and on top of that I am trying to get my dad to go get tested for OSA. The fact that the Sleep Journal requires us to keep almost constant tabs on our alertness levels has made me more aware of how I'm feeling throughout the day. I have made slight adjustments to my schedule to try to take advantage, such as napping (when necessary) when I am at my lowest levels of alertness. Napping is also a tool that I use more now in general. I don't feel bad if I take naps now. When I'm really tired and its late at night and I'm still not done with homework, I come up with the excuse that I need my sleep and call it a night. I think more about sleep. It's made me more aware of my sleeping habits. Whereas before I would oftentimes be tired, and not know why, keeping a sleep journal especially has made me aware of how much the sleep I get at night effects my daytime functioning. I wouldn't say that it's changed my habits, but it's made me more aware of them, which I think is a good first step to getting better sleep. I now sleep earlier, even if I think I need to stay up and have some "free time" after homework. I do not drink any more coffee or eat sugary foods before I sleep. I've been telling everyone I care about how important it is to get sleep! It has made me really monitor how much I sleep. I definitely try to get to bed earlier, and take naps more often. I have learned a lot about sleep and dreams. I have even had a lucid dream or two since class started. Drowsiness is red alert! It has made me more comfortable sleeping when I feel tired rather than pushing myself, and I have gained a great deal of knowledge about sleep issues. S&D helped me become more aware of my circadian rhythm and clock-dependent alerting. I now try to arrange my schedule so that I can make the best use of my most alert time, which is usually around 10pm. Thanks Sleep and Dreams! I make sleep a higher priority, and I tell other about sleep debt and the importance of getting enough sleep. Read about the people who are behind this site and how it came to be. How did we make this website? You can learn how to make a great website too. Find out how!